Joyoshare Media Cutter was updated to the new version, with three non-English languages support, aiming to help customers all over the world to cut and edit videos and audio easily. KOWLOON, China - Oct. 18, 2018 - PRLog -- Joyoshare Studio, one of the pioneers of the world's first multimedia software developers, has recently announced the launch of multi-language support for their professional and popular video cutter - Joyoshare Media Cutter. Both Windows and Mac version of the program are now available in German, French, Japanese, and English as well, so that people worldwide can use it to trim and edit video and audio files in a more friendly way. 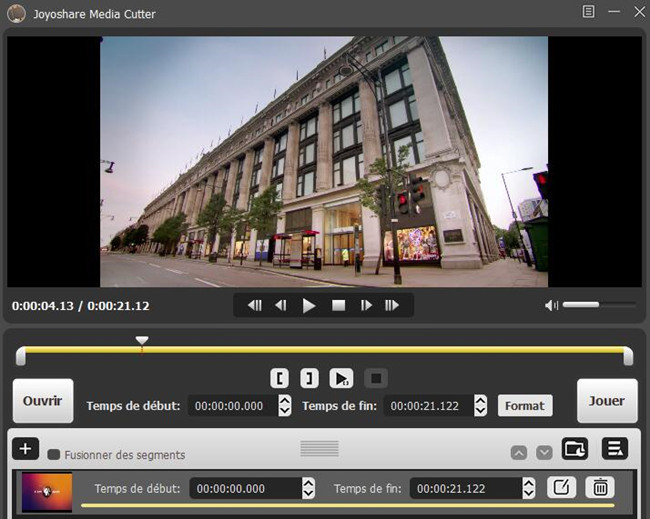 In this new release, one of the well-known video solutions, Joyoshare Media Cutter app has been translated and optimized. Besides the first displayed English, now the software also recognizes and responds in French, German and Japanese, depending on the language preference each customer requests. The feature adds flexibility to the adoption of this tool to cut, trim, split, join and edit any video and audio file through the language of their choice. Users can easily set their language preference by going to the Home > Preferences > General > Language after launching Joyoshare Media Cutter, and then select the preferred language. Done. As a smart and lossless video cutter, the updated Joyoshare Media Cutter has also been able to cut media files more precisely. It not only enables users to cut, split and merge video or audio clips without original quality damage, but also can edit the source files, extract audio from video files, etc., in high quality. Additionally, Joyoshare Media Cutter supports a wide range of input and output media file formats including MP4, AVI, MPEG, WMV, H.264, MWA, MP3, M4R, as well as different common output devices such as iPhones, iPads, Galaxy, smart TVs, game consoles, etc. Joyoshare decided to launch the support of multiple languages due to the accelerated demand from customers around the world. "By implementing several language interfaces to Joyoshare Media Cutter, it not only expands our global reach, but also helps personalize the experience of every user based on their choice of language. We're so excited to do it," said James, Product Manager at Joyoshare. "We are devoting ourselves to creating more wonderful and truly customer experience, hoping they can enjoy our products." The price of the newest Joyoshare Media Cutter (https://www.joyoshare.com/video-cutter-win/) is starting from $29.95 for one license, $49.95 for 2-5 PCs and $69.95 for more than 5 computers, and all of these packages are provided with lifetime free update and technical support. It is now downloadable and applicable for both Mac and Windows systems, including macOS 10.8 to the latest 10.13 High Sierra and Windows 10, 8.1, 8, 7, Vista and XP. Joyoshare (https://www.joyoshare.com/) is an innovative and vibrant multimedia software developer in the world, focusing on the development of the best video and audio solutions to customers around the world. The most popular products include media cutter, video editor, video converter, audio converter, media player, etc. Now the company is expanding its product lines to the iOS utility area with new products like iPhone data recovery, HEIC converter, etc. With professional and attentive service, Joyoshare has won high reputation from millions of registered users over the past years.